or click on the category links below to view our reference list. This heading is followed by a description of the plant which includes the overall height, the general bloom time and any other information which might help you get a better picture of the plant. We have included alternate names or translations of foreign names when possible. These are quoted in parentheses after the plant name. 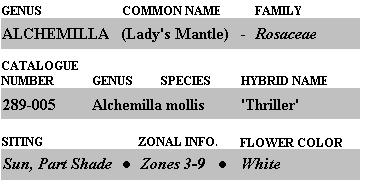 In some instances, we have listed the hybridizer or nursery of origin names - and a few classic dates - in parentheses after the hybrid name as well. Our source for botanical nomenclature is The American Horticultural Society A-Z Encyclopedia of Garden Plants We chose this book because it is a readily available, one-volume work that can be found in most libraries and bookstores. It also has photos of most plants. For plants not listed there, we have relied on the most appropriate references available to us. We grow our plants from seeds, cuttings and divisions. To ensure against soil-borne diseases, all seedlings and cuttings are raised in various soil-less mixtures. All plants are wintered out-of-doors or in cold green houses to make them hardy and ready to grow in your garden. 2-7/8" x 2-7/8" x 5-1/2"
3-5/8" x 3-5/8" x 6"
We are conservative in designating hardiness zones for our plants but they are based in general on American Horticultural Society A-Z Encyclopedia of Garden Plants and our own experience. All our plants are nursery grown. None of our plants are collected in the wild. For more information about our catalogue, please click here.